One day in 1943, a farmer in a small village in central Mexico in the state of Michoacan set out to plow his cornfield. It seemed like any ordinary Saturday, the month was February and the skies were clear. The farmer, Dionisio Pulido, was attending his crop of corn when he heard low rumblings emanating from the earth. This in itself was nothing particularly new; indeed, the area in which he lived, just outside the quaint village of Paricut�n, had been experiencing small earth temblors for the past 2 months. Little did he realize that his life was to forever change due to the impending events that would soon unfold. Suddenly and without warning, much to the farmer's consternation, the earth started to open up before his very eyes. A huge crack appeared in the dirt directly in front of where he stood. Instinctively, Dionisio Pulido attempted to fill the hole with earth. This was to no avail. Soon a terrible odor could be smelt coming from the fissure in the ground, a smell that can only be described as rotten eggs. This odor, which was actually sulfur rising from the fissure in the earth, portended more events yet to come. Much to the farmer's dismay, smoke started billowing out of the ground, the rising gray vapors filled with soot and ash. A terrible heat could be felt rising from the earth's inner core and wisely, Dionisio Pulido fled the scene. Incredibly, what the farmer was unknowingly witnessing first-hand was the birth of a new volcano. Exhausted from the day's extraordinary events and with the sun quickly setting in the western sky, Dionisio retreated to his home for the evening. The next day, Dionisio, along with several others from the village, went out at dawn to examine the location. What they saw both amazed and justifiably terrified them. Rocks were furiously shooting into the sky while the cone of the previously underground volcano now broke through the surface and started growing before their very eyes. Lava started to pour quickly out of the cone's spout and this was enough to convince the villagers to get away as fast and far as possible. The entire cornfield was soon transformed, its surface filled with molten rock that continued to expand across the landscape. 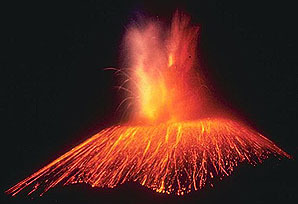 Two villages were buried by the volcano's lava and ash, Paricutin and San Juan Parangaricutiro. 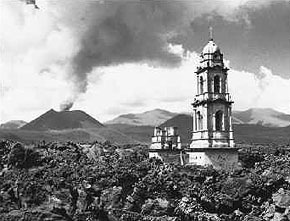 A striking example of the volcano's effects can be seen in photos of the church that was buried neck high in San Juan Parangaricutiro. Only the steeple of the church can be seen today with the landscape forever and dramatically altered with acres upon acres of lava rock stretching out in all directions. Incredibly, there were no fatalities from the falling rock or scalding lava, although lightning that accompanied the original event was blamed for 3 deaths. The former residents of the two villages had to relocate with the memory of that fateful February day forever etched in their memories. What they had witnessed was extraordinary, for what they had observed with their own eyes was the birth of a volcano. 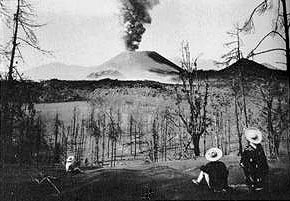 The volcano's cinder cone ultimately reached its full height of 1,391 feet where it stands today. Thankfully, the type of volcano that occurred in Paricutin is classified as monogenetic, meaning that it will never erupt again. In 1952 all activity ceased and it is now considered a dormant volcano. Many people come to visit the volcano which is located approximately 200 miles west of Mexico. The city of Uruapan, located 20 miles south of the site, is a good jumping-off point to take a day trip to see the volcano and the surrounding lava fields. It is a good idea to stock up on supplies in this city, especially water. From this city you'll board a bus to the small village of Angahuan. This small outpost is the closest village to the site and it is here that you can hire a guide for the day. This is highly recommended as the trails are not clearly marked. As well, the option to travel by horseback is available as this adventure will take a full day in any event (14 miles round-trip). Angahuan offers cabins for rent and there is a small cafeteria on the premises. Be sure to wear sturdy shoes as the lava rock can be very slippery and dangerous. The volcano of Paricutin now bears the honor of being listed as one of the world's 7 natural wonders. It holds the distinction of being the only volcano on the planet born in modern times. Eruptions from volcanoes are commonplace occurrences but the birth of an entirely new volcano is genuinely rare.